1758- 1827. He was born on 4 November 1758 at St. Clement Danes in Herfordshire. His family had long owned Woodbridge Abbey in Suffolk, and he was the eldest of five sons of Rev Thomas Carthew and his first wife, Elizabeth Morden, his father having the misfortune to be predeceased by Elizabeth and his next two of three wives, although not before he had fathered an astonishing number of nineteen children. After an education at Ipswich Grammar School and at the Royal Naval Academy in Portsmouth Carthew entered the navy and was commissioned lieutenant on 18 August 1778. During the American War of Independence he was taken prisoner when his ship was captured by the rebels, but he was quickly paroled and exchanged. Carthew’s early career was blighted by the decision of Commodore Pierre Andre de Suffren to hand him and the rest of the Hannibal’s crew over to a the brutal Indian mogul, Hyder Ali. 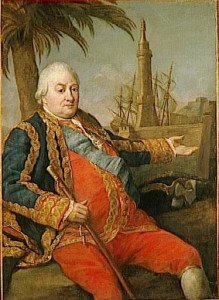 Upon returning to England he was appointed the first lieutenant of the Hannibal 50, Captain Alexander Christie, which took the French vessel Necker 28 and another prize from the Necker’s convoy off the Cape on 26 October 1781. In December the Hannibal sailed for the East Indies to reinforce the squadron there, but she was captured off Sumatra by the Héros 74 and Artésien 64 from the Comte d’Orves squadron after a three-day chase on 21 January 1782. Barbarously, the new French commander-in-chief, Commodore Pierre André de Suffren, handed the entire crew over to his Indian ally Hyder Ali, with the consequence that many died whilst the younger boys were circumcised and forced to enter the Mohammedan faith. Carthew and his brother found themselves chained together during a forced march to Bangalore, but after a harrowing imprisonment they were eventually released in 1784 as a result of the Treaty of Mangalore. Their return to England was greeted with astonishment by the family who had long given them up for dead. During the Spanish Armament of 1790 Carthew was the first lieutenant of the Prince 90, Captain Josias Rogers, which vessel flew the flag of Rear-Admiral Sir John Jervis. He was promoted commander on 22 November 1790 and early in the following year commissioned the Ulysses 44, in which he sailed for Gibraltar in May to embark the unpopular HRH Prince Edward and his regiment for conveyance to Canada of the following year. Unfortunately he fell out with the prince over matters of discipline, on which subject the royal was particularly severe, but on returning to England he was exonerated by the Admiralty. The Ulysses was then paid off at the end of of the year. Carthew thereafter spent some time in Paris with his brother before fleeing at the start of the Revolution in 1793 whilst reputedly facilitating the escape of some aristocratic women. Apparently during their time in Paris the brothers had identified Suffren in a box at the theatre and had only with difficulty restrained themselves from confronting him, however this was possibly apocryphal or may have occurred on an earlier visit, for Suffren had died in 1788. Carthew was posted captain on 10 May 1794, and commanded the floating battery Redoubt 20 on the Dutch coast under the orders of Vice-Admiral John MacBride until July 1795 when he was appointed to the Brilliant 28, also serving in the North Sea. His next command was the two-decked Regulus 44, which he joined in May 1796, and with which he captured the Spanish sloop San Pio 18 and two merchantmen in the Atlantic on 2 November whilst proceeding to the West Indies, captures that ensured his pockets became well-lined. On 6 April 1797, being in company with the Magicienne 32, Captain William Henry Ricketts, their boats attacked the privateer base at Cape Roxo, San Domingo, and destroyed thirteen vessels. Eventually, in the summer of 1798, Carthew was obliged to return home through ill health, but not before he had remonstrated with the tyrannical Captain Hugh Pigot of the Success 32 for his oppressive behaviour to his crew, a trait that would later see this officer murdered by the crew of the Hermione 32 to which he had removed. After returning to England Carthew did not see any further active service. He retired as a superannuated admiral in August 1812 and became a long-standing magistrate in Suffolk, where he lived at Woodbridge Abbey. He died suddenly on 21 July 1827 whilst riding in his carriage. In the early 1800’s Carthew married Pleasance Myers, a niece of Lieutenant-General Sir William Myers, but did not have any issue. His brother Tom was a marine officer, and served with him aboard the Hannibal in 1782 before later joining the clergy.